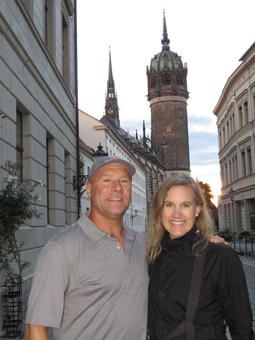 We recently returned from a mission trip to Europe that lasted approximately three months. To understand why Europe is an emergent mission field today, please read about Europe's spiritual reality here. I was also recalling how, as a fashion model earlier in my life, I’d come to Paris, which was my first European experience. This was integral in learning about the differences in culture and life overseas in Europe, something very important to understand in missions. As I remembered all these formative experiences, I began to see that the background I and Mercedes both had was key to what Europe and many other places in Christ’s Body need today. We were blessed to minister in Europe and see the Lord pour out His Spirit in many places including London, pictured here, as well as in different citites in Sweden and France. 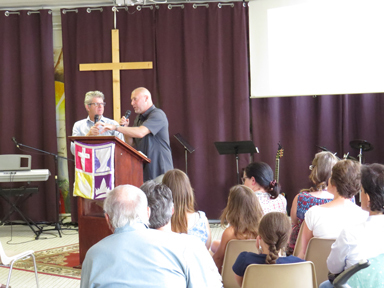 Ministering in the Loire Valley of France in the city of Tours at Communaute de la Re-Naissance Church. Bryan speaking through interpreter and good friend, Pastor Jean-Francois. One of the main things that predecessors like John Wimber and Lonnie Frisbee and Harald Bredesen—people who directly and personally impacted our lives—emphasized, was the need to empower and equip the Body of Christ in the power of God to do evangelism and Kingdom works. Lonnie Frisbee was greatly used in evangelism and empowering the Body of Christ as was John Wimber in equipping the saints to do Kingdom works! Harald Bredesen led so many, including mainline denominational believers from all kinds of strata of society, into the Baptism of the Holy Spirit. Martin Luther, the great reformer, both recognized and emphasized the fact that the Body of Christ was “a priesthood of all believers.” It is a priesthood that must be empowered and equipped by the Holy Spirit in order to fulfill its mission and calling. Like walking through the wardrobe in C.S. Lewis’ The Chronicles of Narnia, I began to see as we ministered in Paris that the Lord had been preparing not only me, but both of us, throughout our lives, for what the Body of Christ needs there so much—to be empowered and equipped by the Holy Spirit to live out and share the Gospel themselves. This is needed actually all over Europe, as well as in so many other places today: even fellowships that may have a Charismatic or Pentecostal name have so many in their ranks that are in need of the empowering and equipping of Christ’s Spirit. Bryan praying for people in the congregation in the Arche de Dieu Church in Paris where we preached at. Many were empowered & filled with the Holy Spirit there that day when we ministered as well as some who receieved Christ. 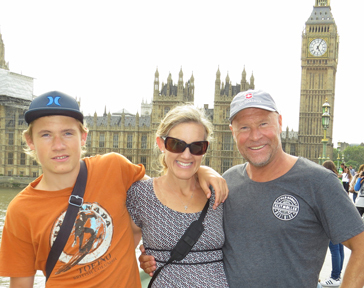 Praying for some young kids who got powerfully baptized in the Holy Spirit when we prayed for them in London, England. The Lord also brought deliverance, healing, and a powerful filling of the Spirit to many, and there were also some who responded to surrender their hearts to Christ! Glory to God! The Lord moved powerfully as well when we ministered in the city of Tours, which is about 2 hours south of Paris. We ministered in two different congregations there and saw significant moves of the Holy Spirit where many were renewed, encouraged, empowered, and equipped as well! We experienced a great wave of refreshing that brought renewal and encouragement to the believers there. France is a place where Christians experience a lot of opposition and resistance, both in the natural and spiritually as believers, as it is a country that prides itself on being a “secular state.” Some areas of the country even ban the public sharing of one’s faith. Thus, believers who actually have a living faith in Christ are looked down on and seen with scorn as a regular prevailing attitude. American culture, as messed up as it is today, still isn’t as brutal towards believers as French culture. So, seeing and experiencing believers being filled, renewed, empowered, and encouraged there is a very important work of God’s Kingdom! As another mission group said recently: France is one of the most strategic, yet battle-heavy places on the front lines of mission today! To be part of seeing the Lord equipping and empowering God’s people there in such a mighty way is inspiring! Many were encouraged with the need to share the Good News and the love and mercy of Christ with others! As we ministered in Sweden the Holy Spirit moved powerfully! We were having a dinner our first night after we arrived with some friends. While just sharing some Holy Ghost stories as we ate, the power of God began to fall on our hostess. We saw that the Lord was touching her powerfully the more we shared, so we began to pray and lay hands on her. And as we did, the presence of God increased. The Spirit of God just took over and transformed the dinner into a time of ministry and praying for one another. As the Holy Spirit was poured out, everyone who was there received, glory! The next night, the Lord also filled a lot of people with the Holy Spirit as we ministered at a scheduled church meeting. Some former Muslims who have been converted to Christ got touched and filled with the power of God. We also had a few people there who responded and made decisions to surrender their hearts to Christ, and these included some with Muslim backgrounds. We prayed for many there after preaching and heard many testimonies of those who were significantly ministered to: This included a man who received healing to his bad back. He and his wife were filled with joy as they told us later in the week of how he was able to now work around the house and go in the attic, things he couldn’t do before! His daughter shared how the Lord had poured such grace and power on him when we prayed; she said she herself felt the power of God and heat come upon him as we prayed, which he said relieved his pain! We had a tremendous and unexpected outpouring at a youth meeting we did next. The church we were working with invited a youth group from another church to combine for a special meeting we would minister at. We could sense a spiritual battle as some in the meeting were being distracting so we prayed that we could get things back on track with all the distractions going on. However, as we moved into a ministry time, the Spirit fell upon the meeting with an overwhelming and unexpected wave of power as we began to pray and lay hands on the youth. The power of God swept in so dramatically it just blew us away, tears flowed as the Lord touched and ministered to the deep places in their lives. The power of God just kept increasing and many were touched deeply as the move of God carried on for hours! It was a powerful time! A young lady shared afterwards that this is what she had been praying for with a couple of her friends. She told us that many who had come to this special meeting were not Spirit filled. We realized afterwards that this was why there had been so much warfare, the Lord dramatically poured out His power, touching many there for the first time! We ministered at the Sunday service at New Life Church, sharing about the way God has brought renewal often in unexpected places, like with the Jesus People and the Vineyard movement. The Holy Spirit filled and renewed many as we moved into the ministry time with a powerful wave of His refreshing presence. We were blessed to see people receiving and being empowered and equipped as the Holy Spirit poured out His presence! The Lord was releasing new life to do the works of the kingdom as He empowered his people! Hallelujah! With friends at Lineakyrkan in Gothenburg, Sweden. We ministered for the first time in Gothernburg and had a number of divine appointments. 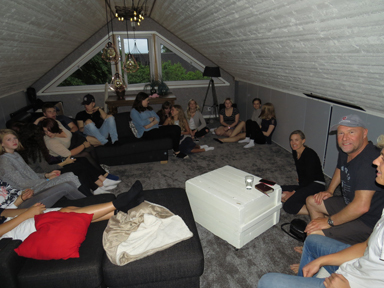 Sharing at a youth meeting in Hässleholm, Sweden. We had a tremendous and unexpected outpouring of the Holy Spirit that lasted for hours. We were stoked to have the opportunity open up to minister in the city of Gothenburg for the first time as the Lord opened a door to preach in a church there. We had some powerful divine appointments even before we ministered at the church. The night before the service we were out walking, just checking out the city. 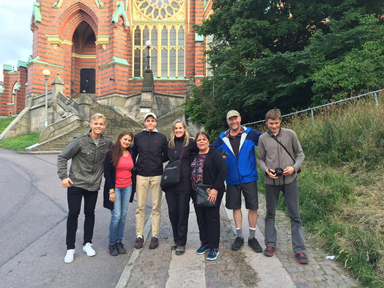 We ended up walking right into some friends who were from the church we had just ministered in over in Hässleholm. So we all decided to hang out together and walk around for a while. At one point, we were taking some pictures together in front of an old church and ran into a few obstacles trying to get someone to take a group pic for us. After two negative instances with rude people I was giving up on the idea, when the still small voice of the Holy Spirit unexpectedly prompted me to ask a woman walking up the street to help us. The Lord wanted us to talk to the right person as He had more planned; the lady we asked was nice and helpful and took a picture for us. Then we began to witness to her after the picture and she all of a sudden enthusiastically shared that she was Iranian but a born-again Christian! We were all surprised at her outspokenness and enthusiasm. I felt led to ask if she needed prayer for anything, and she shared that she was having bad knee pain as she walked around. We prayed for her right there, laying hands on her. She was powerfully touched by the Holy Spirit right there on the street. She shared that she experienced healing—the pain in her knee had left! She was overflowing with joy and excitement and said she wanted to share the Gospel with people of her nationality more than ever! Maybe even go to Iran, she said, and share the Gospel there! The Swedish friends with us were hit by revelation of how much God can do when you step out in faith, even out on the street, something not the norm in Sweden! When we ministered at Linea Church the Holy Spirit met us in power and touched so many there! It was not really a full Charismatic church, and was pretty good-size for Sweden, so it was even more of a breakthrough to see a lot of people being filled with the Holy Spirit, some for the first time. We were stoked to see the Lord touching and filling many with His Spirit as well as there being a couple people who made decisions for Christ! There were also a couple people who had just received Christ recently from Islamic backgrounds that were powerfully filled with the Holy Spirit, hallelujah! We had a divine appointment in the streets of Gothenburg where we got to pray for an Iranian believer for her knee to be healed. Praise God, the Lord answered and also greatly encouraged her to share her faith with her family and friends. 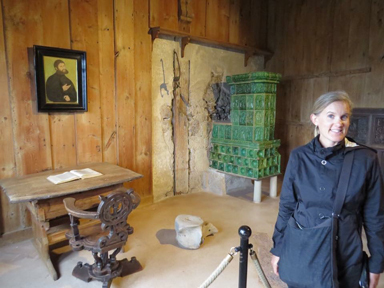 Inside the Wartburg Castle in Eisenach, Germany by the desk where Martin Luther translated the New Testament into German while hiding from the authorities. We ministered in Gamleby, a place we are quite familiar with. We did a meeting there in a little fishing shack right upon the sea which our friends have dubbed The Sea Church. We also did a lot of personal ministry to our friends we stayed with, who were in need of some refreshing. In fact, I made a random stop on the side of the road as we were on our way to stay at their house, and there right before me on the ground was a box with our friend’s name on it. Wow, that was quite surprising! I knew it was a sign from the Lord of the need to minister to our friend, who had some health issues going on as well. The Holy Spirit met us in numerous situations every step of the way, while ministering at the little Sea Church, but as well in great power in many surprising moments where the Holy Spirit just showed up and led us into many spontaneous ministry situations. Even while just taking some time to relax and get refreshed, the Spirit of God would just invade and bring forth awesome times of outpouring, ministry and refreshing. 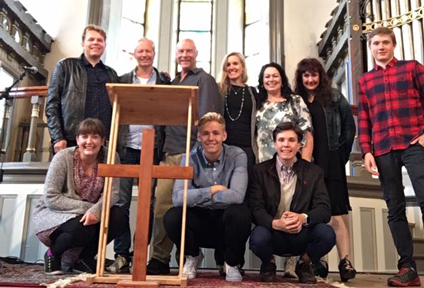 We had plans made to do ministry up in another part of Scandinavia. However, the pastor’s family there had a health emergency and had to leave for urgent surgery and intense treatment out of town. After spending some time praying for their situation, we needed to step back and pray for our own and get God’s leading as what the next step should be for ourselves as to the unexpected change in plans. We took a side trip into Italy, as we needed to catch our breath anyways and needed a little time to seek the Lord’s will as to what to do. We had a refreshing time there, and as we prayed, I kept discerning that the Lord was leading us to contact a pastor in London and see about ministering at his church there. This ran quite counter to human reason, as England, and especially London, is a place that typically plans ministry way in advance. This would definitely not be a “common sense” idea. The Lord seems to like to defy common sense though—for us it has happened many times, and for some reason especially in England. This turned out to be another step of the Lord leading in an unexpected direction! The pastor in London said that he in fact had just been thinking about us and was hoping we would contact him about ministering in his church. We were blown away at the Lord’s leading and timing! We set things up to go to England to minister in London and made our way there. 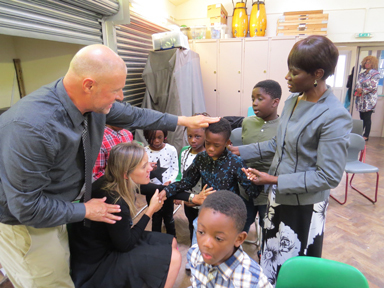 As we ministered in London, the Lord poured out His Spirit on many there who were baptized in the Holy Spirit very powerfully, including some kids who got touched so beautifully and deeply by the Holy Spirit and others experienced healing and a couple made decisions for Christ, glory! 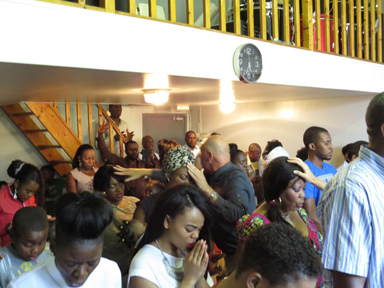 We also had a number of divine appointments in different parts of England: while staying with some friends afterwards we ended up praying for them one evening and the Holy Spirit showed up in power. While making a brief stopover in Cornwall, we also went by and grabbed a few waves in front of the Tubestation Church, a place we spontaneously ministered at last year. We just showed up this time around and ended up praying for and ministering to three different people in three different situations, as well as getting a few fun Cornish waves! the Castle Church in the background. burned at the stake by the authorities. 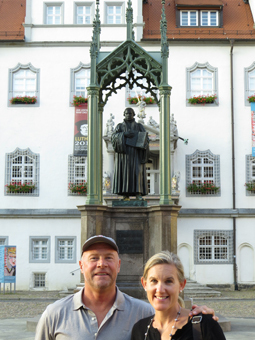 We were blessed to go through Germany before returning home, and were blessed to visit various sites of the Protestant Reformation. This was especially poignant as we approach the 500th anniversary of the beginning of the Reformation. Luther’s influence was considerable and carried forth into revivals and later mission movements. It all started with his conversion to Christ when he was born again while reading and wrestling with the book of Romans. 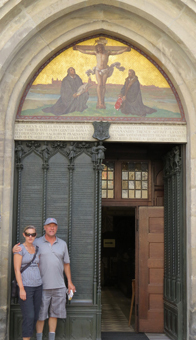 He subsequently nailed his 95 Theses on the Castle Church door in Wittenberg. This ended up initiating the Reformation. We felt God giving us much confirmation of the importance of staying centered on biblical truths of the New Testament as we spent time there! There was some heavy warfare just getting going on this trip, our flight was delayed over 16 hours just coming to Europe and it seemed like they were going to cancel it at some points. But finally, at 3:45 in the morning, after praying and waiting what seemed like forever (16 hours is a long time to wait) our flight at last took off! It took some time to recover from that exhausting experience right out of the starting gate. 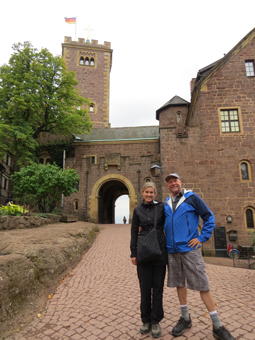 We also had a few extra expenses that came with unexpected changes that hit us during the trip. Any and all prayer and financial support is much appreciated. We praise God to see His power moving in Europe, your support helps us to keep reaching out!